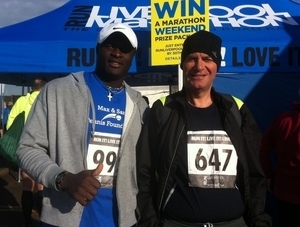 Rainford Tennis coaches, Samuel Jalloh and Steve Vincent, completed the Liverpool Half Marathon today, to raise funds for the Sam Jalloh Sports Foundation, who run and support sports programmes for underprivileged children in Africa. The Foundation run coaching and competitions, provide clothing and equipment, improve facilities, support educational opportunities and support talented players. Sam and Steve completed the 13 mile race around the city of Liverpool to raise funds to help support the Foundation’s programmes, in countries such as Sierra Leone, Gambia and Ghana.